There was no hiding the proud smile on the face of Austin Blackburn, Director of Go-Coach, as he launched his new Dartford Darts service with representatives from Kent County Council. Austin’s name will already be familiar to many readers, as not only does he head the Go-Coach bus operation, he is also the lead man behind the Bus Doctor mechanics service. This latest launch sees his business become even more entrenched in the county’s bus scene. If the name of the service has not already given it away, Dennis Darts purchased from Abellio are being used on the routes. The 8.9m 25-seat buses are ideal for the service, according to Austin, being the right size whilst comfortably meeting the Council’s specifications. Based at Go-Coach’s Sevenoaks depot, the vehicles join a fleet of 23 PSVs, which consists of 21 buses and two coaches. Three double deckers are soon to join the fleet, one of which Austin aims to sell. Originally, he planned to take another depot in Dartford to run the Darts from, but was unable to find the ideal site in the town. The area is undergoing a lot of redevelopment of late and as such spare land that could be used for storing buses is not easily come by, with a lot of it being used for new buildings. Go-Coach has a good mix of work. In addition to a private hire operation, Austin runs an all day commercial service, six tendered services for Kent County Council, a works contract and a number of school runs. The PVR is 18 vehicles. 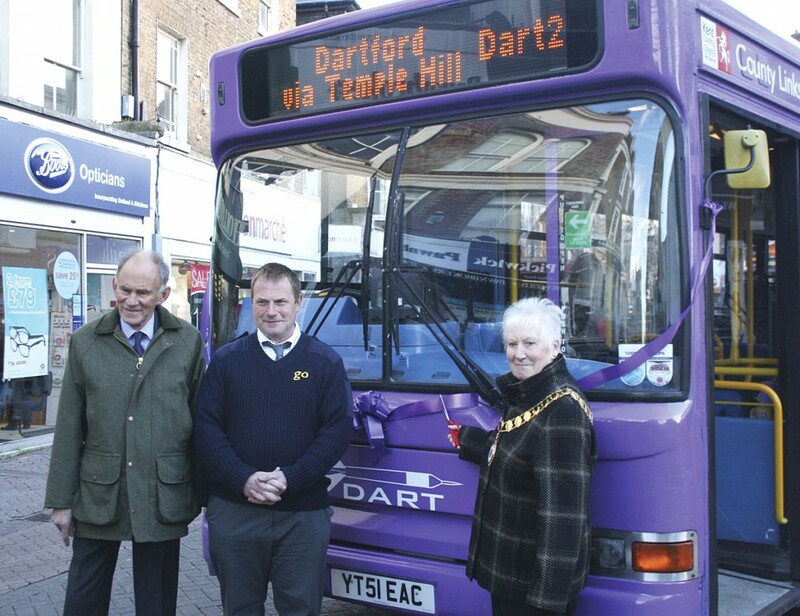 One of the Darts was displayed in Dartford’s market place during the launch event, which generated a good deal of genuine interest. One official from the Council noted that these sort of events draw a lot of onlookers, but tend not to attract many people to approach staff from the operator to get more information. However, on this occasion, this was simply not the case, as Austin was inundated with enquiries from the public in the vehicles and services. Dartford Darts replace the previous 453, which ran in a figure of eight around the town. Previously operated with one bus as a hail and ride service by Arriva, it was won by Go-Coach in April last year when Kent County Council put it out to tender. The local authority told Austin there was money available to enhance the service and suggested he send them a business proposal outlining what he would do if he was able to run another vehicle on the route. He did this and went through a whole host of meetings over a nine month period to develop a finalised version of the plan. Adding a second vehicle has enabled the timetable to be extended and run on a scheduled basis, with buses running later into the evening and earlier in the morning. Running to a half hourly frequency, the service starts at 07.20 and the last bus leaves Dartford’s Market Street at 18.20. The new services run on two circular routes, splitting the previous figure of eight operation in two, enabling better frequency. There have also been some alterations to the route, which has been redirected in places to serve even more locations. It is not just a better service that Darts passengers will benefit from, with Kent County Council investing in better infrastructure. This comes in the form of new bus stops across the town. Section 106 funding was provided for the routes, with the David Lloyd leisure centre also providing money to get it off the ground. The site is one of the facilities served by the buses. Kent County Council is also paying for a Hanover next stop announcement audio system for the Darts. The Council is to pay for the devices, whilst Austin’s Bus Doctor engineers are to install them. When developing the Darts service, the local authority and the operator took account of the core customers, many of whom likely to be elderly or disabled, hence the requirement for extra aids to make using the buses easier. Bus Users UK and Guide Dogs for the Blind also encouraged the installation of the equipment. Unusually, the systems provide external announcements to alert passengers of the bus’s arrival and what service it is providing. Taking into account the fact the vehicles pass through residential areas, the technology has ambient sound measurement that facilitates volume adjustment for the messages to ensure they are loud enough in busier parts of town and not too loud in quieter parts. To Austin’s knowledge, there is no other bus service with this sound measurement technology fitted. It goes beyond the capabilities of the next stop announcement systems on London bus routes.